Vworp Vworp! The new Doctor Who companion is Pearl Mackie! 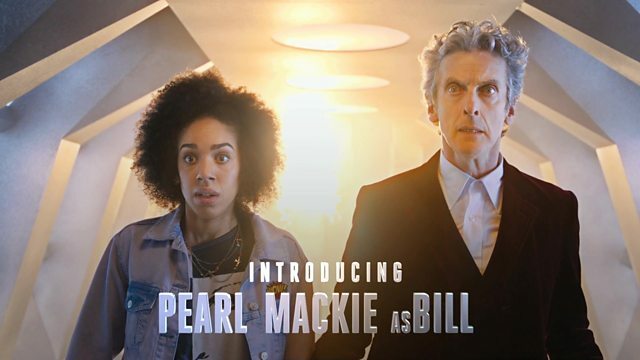 Announced on Saturday 23rd, at halftime during the FA Cup semi-final, the 12th Doctor’s new travelling companion was finally revealed in an action packed exclusive scene as Pearl Mackie, her character is called Bill, and will join Peter Capaldi’s incarnation of the Time Lord on his adventures in Time and Space. She replaces Jenna Coleman, who left the role of Clara Oswald at the end of series 9 last year. Pearl Mackie, who graduated at Bristol’s Old Vic Theatre School, is a brilliant young talent from Brixton, South London, has also recently performed I’m the national Theatre’s West End production of The Curious Incident of the Dog in the Night Time. Pearl has also appeared in another BBC show featuring Doctors – the daytime medical drama series Doctors. I’m sure Pearl Mackie will be a great as the new companion, and I look forward to the 12th Doctor’s and Bill’s adventures! The new series of Doctor Who is set to begin filming later this year and will be broadcast in Spring 2017. Season 10 will be Steven Moffat’s final series as showrunner before Chris Chiball takes over for Series 11. Finally, after the months of waiting, here’s the special video introducing the brand new Doctor Who companion Pearl Mackie as Bill! Jenna Coleman is going to be a tough act to follow, her rapport with Capaldi was great but I look forward to seeing what Pearl Mackie brings to the series – that short was a lot of fun.